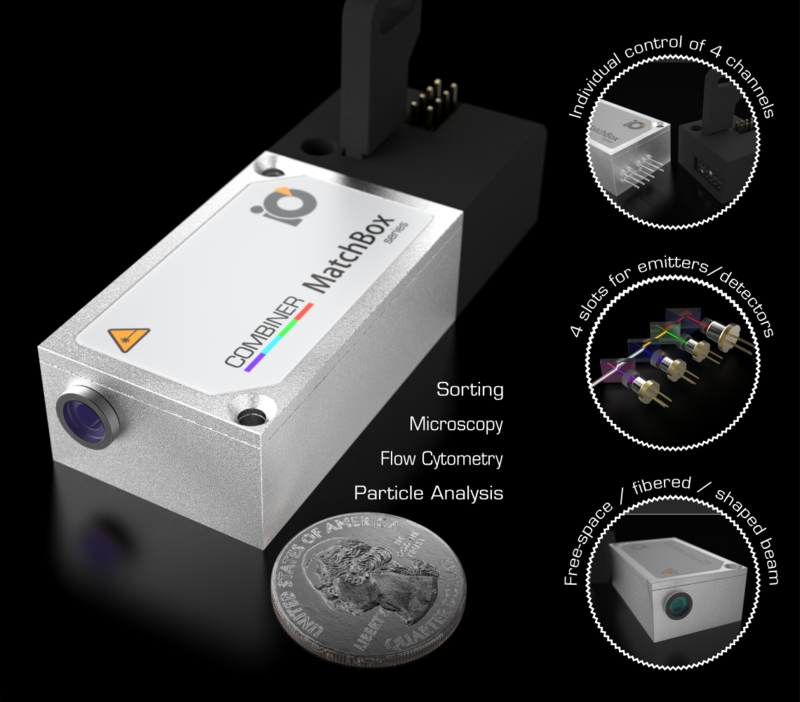 The MatchBox Combiner is a configurable turnkey emitter/detector system for life sciences, sorting and particle analysis applications. It has a standard MatchBox footprint and is compatible with a rich set of MatchBox accessories. Common output beam shaper, such as line generator, DOE, focusing optics, etc. 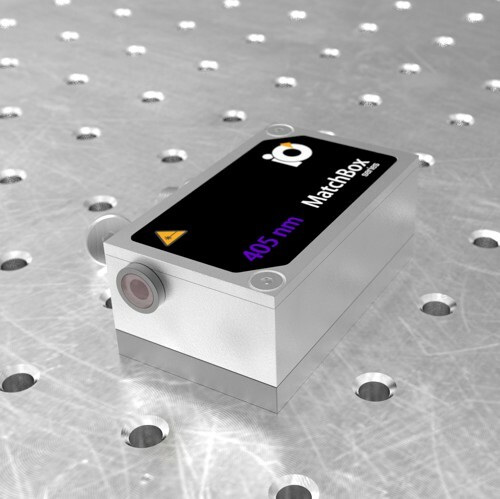 The MatchBox laser combiner includes 4 laser diode drivers and digital control electronics, which allows smart control and diagnostics of the complete module. 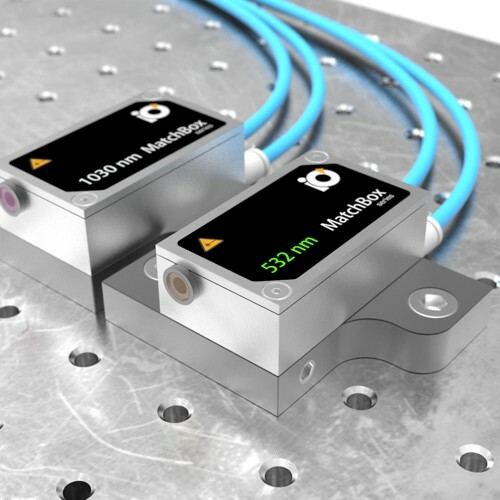 The laser unit is designed as an integration-ready electro-optics unit, which can be connected to a control mainboard and power supply of an instrument. 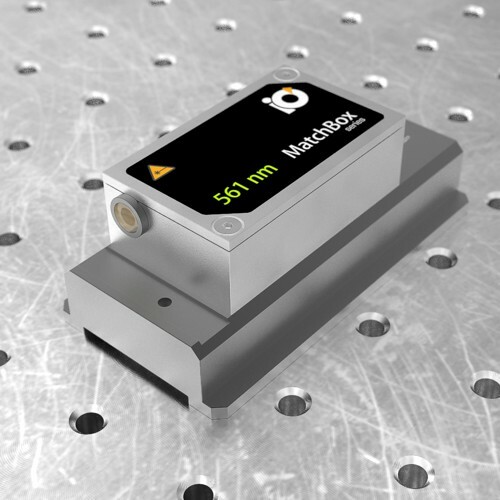 This way the laser/detector unit provides unprecedented compactness and functionality. Thus mass production of multi-wavelength instruments becomes much easier and faster. For scientific installations and various experimental setups, the laser combiner is provided with a quick-start breakout box, which has conventional ports for control, power and safety arrangements. 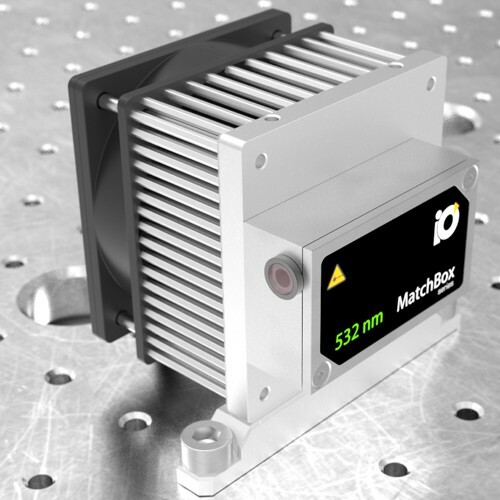 MatchBox series lasers (2nd edition) feature a Universal Asynchronous Receiver/Transmitter (UART) controller interface. The pinout of MatchBox Combiner is an expanded version of standard MB2 pin-out. The lower row of pins is the same as for single-wavelength lasers, while the second (upper) row is added for individual TTL modulation of each laser diode installed in the combiner. A 'breakout box' is used for converting UART into USB or RS232 protocols. The converter chip for USB is 'Silicon Labs CP2102' and for the RS232 it is 'MAX232'. 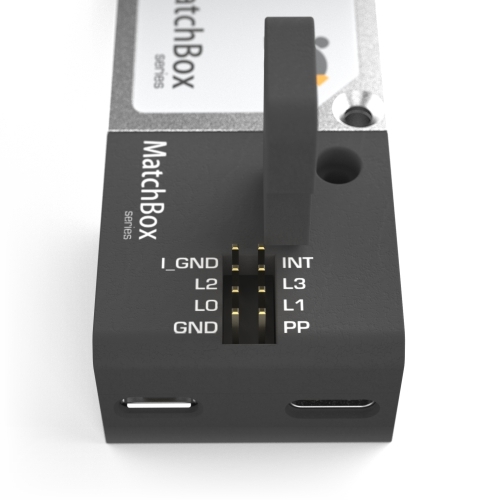 Aditionally, the breakout box of MatchBox combiner is equipped with necessary circuit for communication with QC2.0 and QC3.0 power supplies. 10 pins at the back of the laser combiner provide full access to complete functionality of the combiner. Pins are located at the back side of the enclosure and distributed in a way, which allows to implement a mechanical reverse lock. Prerequisites for such integration are a microcontroller mainboard supporting UART communication, 9V (or QC2.0 or QC3.0 compliant) power supply and 4 TTL channels for individual on/off modulation (or fast PWM power control) of each laser diode. Prog. 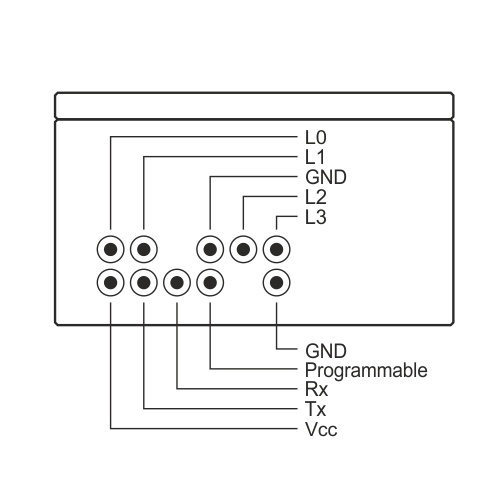 pin needs to be programmed to set 9V voltage, if a QC3 or QC2 compliant USB power supply is used. Another use of this pin is to control fan of a heatsink, based on laser body temperature. ** for communication with QC3.0 compliant power supply, the programmable pin needs to be configured for communication with the power supply. L0, L1, L2, L3 are all TTL modulation pins for corresponding LD channels or read-out pins for photodetectors, depending on product configuration. Power USB-C (right) connector is used for connection to a QC2.0 and QC3.0 compatible power supply. FAN ctrl. 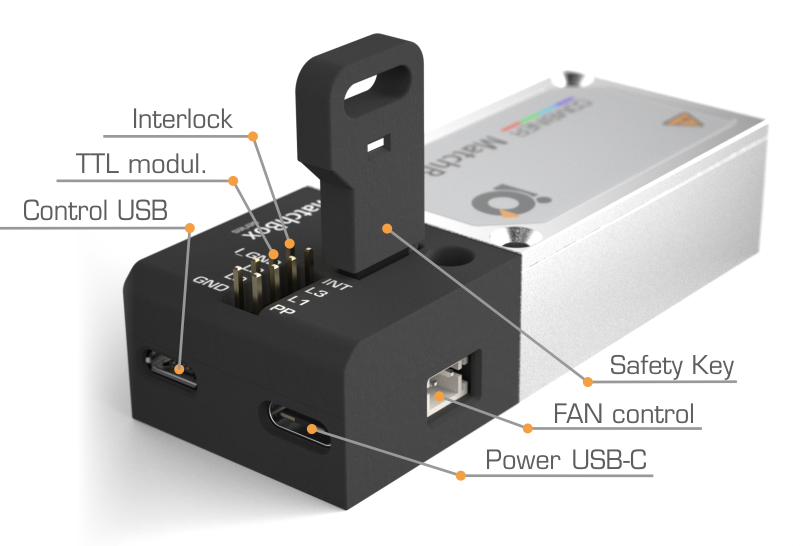 connector (not visible, on the right side of the breakout box) is compatible with all our fan cooled heat sinks.